Reverse Scrap-bookingTM is a tool for you to use in manifesting the people, circumstances and experiences that you choose for your life. That dream mate, your perfect job, new home, or blissful vacation! You can use it to flesh out what that body will look like when you lose the extra 10 lbs or how you would want to feel on a day-to-day basis. It could be the business you want to create or that car you have had your eye on for years. Whatever it is you want to create in your life, reverse scrap-booking(TM) will help you to play your way to having it! How do I start my reverse scrapbook(TM)? 1.A) Well, I would start by sitting down and writing out what it is you really want to create for your life and what areas you want to focus on. I tend to keep a page for all areas in my life and everything I am creating in my business. Once you have identified your areas of focus, sit down and write a paragraph or a page on what you want to create in that area of your life. a) A beautiful book to create your future in. This is my latest and it TOTALLY inspires me. I get happy just looking at the cover! d) A pile of magazines, pictures, books etc. that you don't mind cutting up. e) Anything else that you are inspired to use in creating images that inspire you, glitter, stickers, colored paper, ticket stubs, scrap book stuff. 3) Begin creating your future! Pick what page you want for each topic, create a heading and begin to fill the page with pictures and words that *inspire" you. This is a wonderful opportunity to use creativity and play in powerfully creating your life. And, if you happen to be one of those people who do not consider yourself particularly creative or not a lot of fun, then this exercises is a must!! 4) For extra fun you can leave blank pages beside the ones you create and you can begin to fill in the blank pages with pictures and mementos of your life as your reverse scrap-bookTM pages start manifesting themselves in your reality! 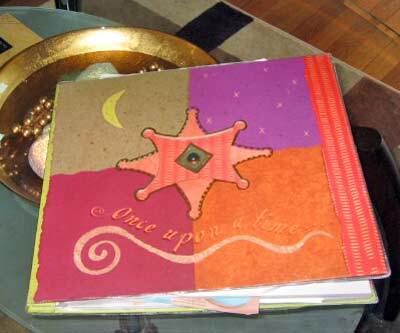 The invitation: To begin creating loving memories of your future and start your own reverse scrapbook(TM), ask yourself...If you could have it any way, how would you have it? Life that is...Your relationships, your home, your work, your body...If you could walk around the world feeling a certain way, what would it be? Joyful, peaceful, grounded? How would you spend your days? What mark would you like to make on the world? Get clear my friend and then build it, one little colorful piece of paper at a time. Delight in the process and know that this exercise in creativity is bringing you one step closer to living the life you imagined. 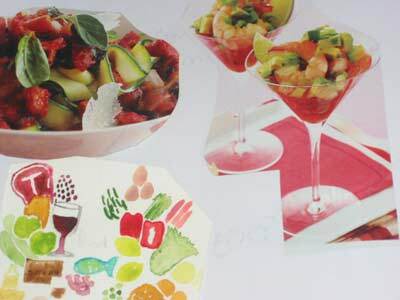 If you want to get started on your creation you can learn more about the reverse scrap-booking(TM) process and see some real life examples, click here to read more.